Some of the highlights from Day 6 of New York Fashion Week. Timo Weiland's collection consisted of many pieces that I would definitely wear. From the dress with the cut out detail at the front (above, far left), to the deep red sweater with patterned detailing (above, third from left), this was a collection that quickly caught my eye. I loved the mix of the more casual pieces against the the more uniformed and dressier outfits that were shown. 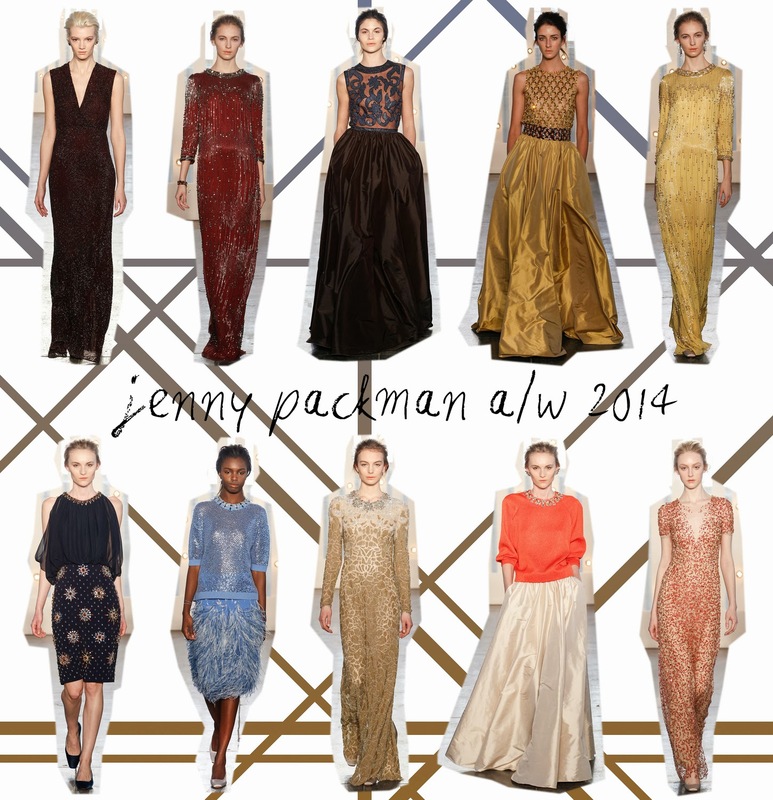 Jenny Packman. Wow. What a collection. Every piece featured was as stunning and as elegant as the last. This collection was definitely my stand out from day 6. The attention to detail was beautiful and then pieces were sophisticated and stylish. I loved the embellishment that was used throughout many of the pieces and it really added to the designs. The mixture of textures between two pieces in an outfit created a dimension to the collection that really worked well. I really liked the mixed color palette that was chosen. There was a nice variety between darker pieces, metallic and lighter colors. This again added to the range and the versitilty of the pieces. The gowns looked amazing as they went down the catwalk and I'm hoping that we may see someone wearing one on a red carpet event in the near future. 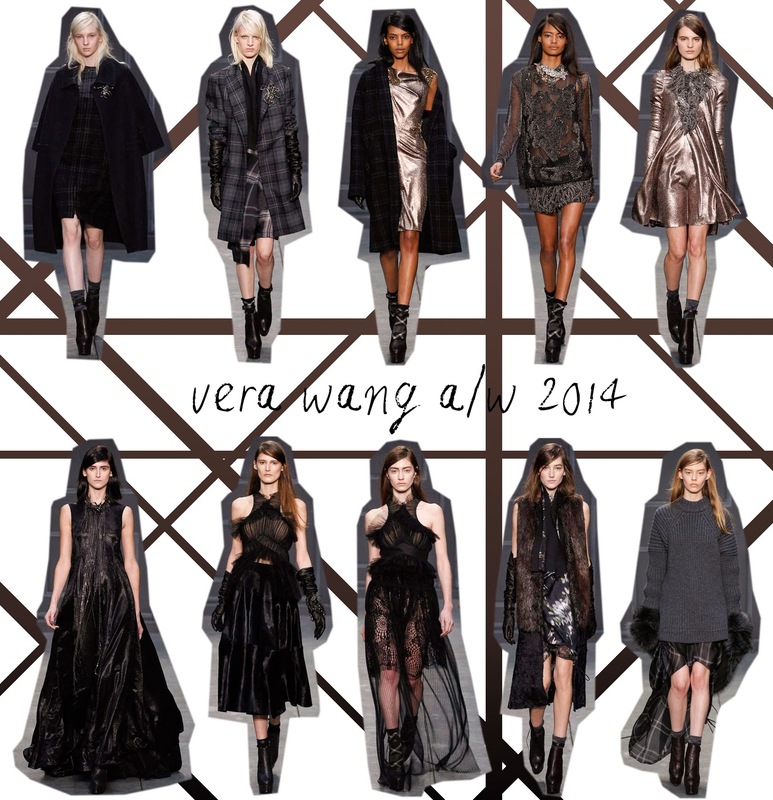 Vera Wang's main colour choice for this season was black. There were only a few pieces that weren't based around the black fabrics. This color choice worked incredibly well with the designs and style of the pieces. They created elegant yet edgy designs in a variety of cuts and styles. Not only were the cuts stylish and eye catching but, much like with Jenny Packman, there was great deal of detail added. This detailing looked beautiful. Whether it was lace, ruffles or embellishment it really lifted the designs. One of my favorite pieces consisted of separate shorts and top with an amazing amount of embellishment involved (top row, second from left). It is beautiful and looked stunning as the model moved down the catwalk. 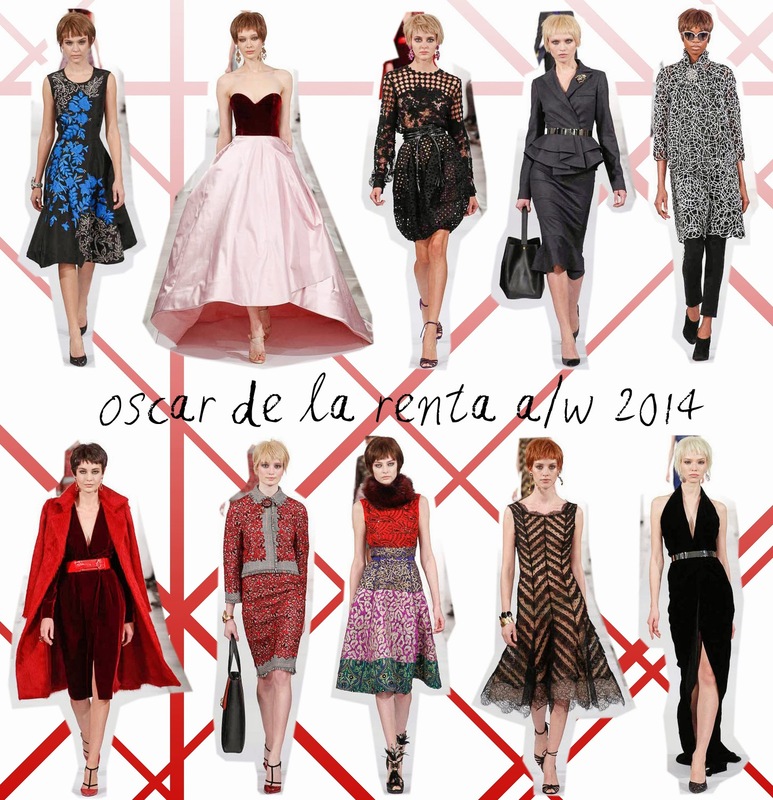 Oscar De La Renta create a collection that offered variety, wearablility and sophistication in many of it's pieces. The dresses were sometimes extravagant but I expected this from the designer. I loved the mixture of both patterns and fabrics that were used to create individual designs that all worked along a similar idea. This meant the collection worked really nicely as a whole and nothing really felt out of place. 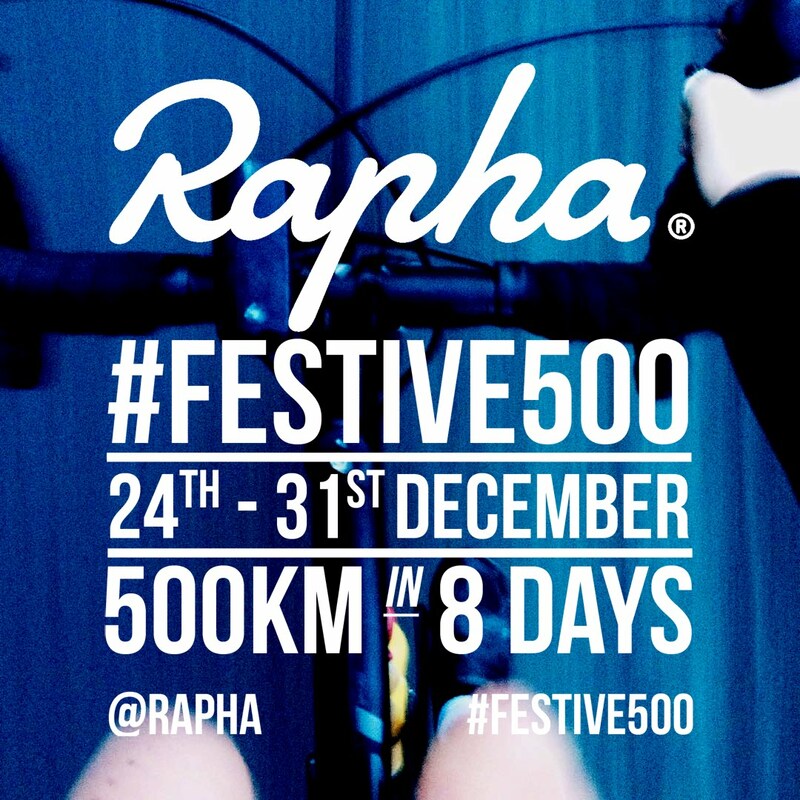 This is definitely a collection worth checking out. One of my favorite outfits was an all red affair (bottom left) that mixed a deep rich red velvet with a lighter heavier coat. I loved the contrast of the two tones and think that the same color belt broke the outfit up beautifully. Marc by Marc Jacobs. 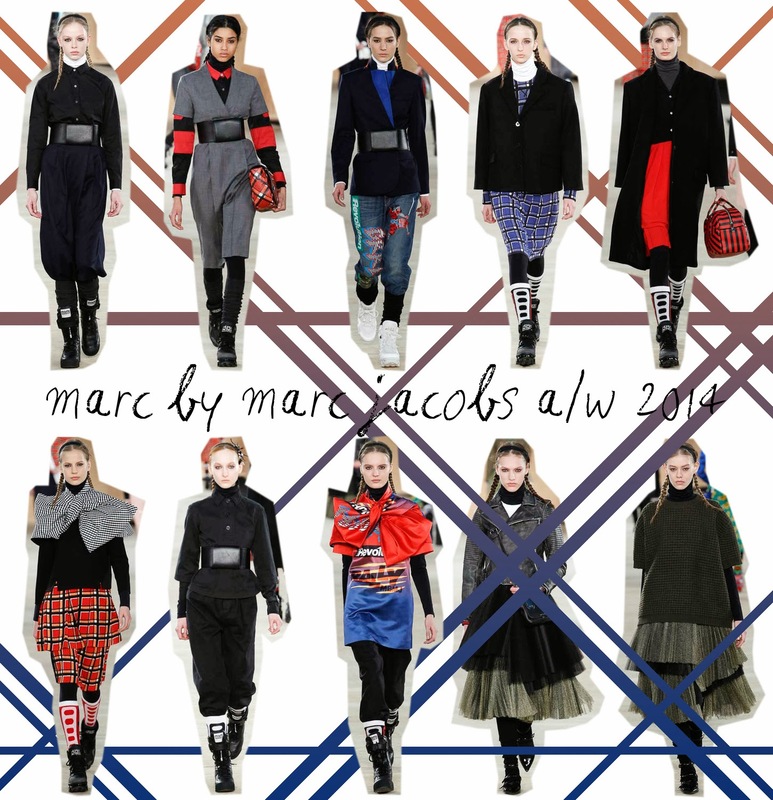 This was the first collection where we saw the designs not headed by Marc Jacobs himself. After he had stepped down from creative control of the brand British designers Luella Bartley and Katie Hillier now head this diffusion line of the brand. The founder of the brand was seated front row to watch as this new collection hit the runway. The thick belts that cinched the models in at their waist gave a very ski like feeling to many of the pieces. This mixed with the loose trousers, layering and high necklines really did feel like old school jumpsuits that are used on the Alps. I still really liked this collection though. The big bows, knitted jumpers and oversized fits of many of the pieces created an edgy collection that still remained stylish. It had a more casual feel to some of the pieces but I think this worked nicely to create an overall rounded collection of clothing. Blacks were quite heavy featured today. Checks were also featured in quite a few collections. They were of varying sizes but mainly themed around monochrome.